According to the Hylian scriptures, long ago 3 mythical gods descended upon a baron, lifeless rock. The gods each possessed a power unique to their light. The red god, endowed with the light of power, scorched the earth and created land fertile for growth. The blue god, endowed with the light of wisdom, created the atmosphere, the grass, trees and sea. The green god, endowed with the light of courage, created life, the animals on the land, in the sea and the birds that soared in the skies. After the gods had finished their creation they left the world they had created but before they left. They created a symbol of their combined efforts and accomplishments, into an object, a golden triangle known as the Triforce. A small but powerful portion of the essence of the gods was held within this mighty artefact. 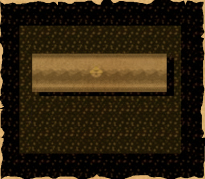 The artefact was only ever recorded in the earliest of the Hylian scrolls some 5000 years ago, though after those scrolls all traces of the existence of the Triforce lay in shadows. People all through out time have searched for the Triforce with good reason. Though the Triforce was an inanimate object, within its golden shell it housed the ability to grant any wish the receiver desired. It seems impossible that one could find an artefact this great by chance, though by chance is what happened. About 2000 years ago Scripture 26:32:03. A man from the desert plains known as Ganondorf Dragmire. Who took unto himself to find this wish granting artefact began his quest for this power. It soon drove him mad, only caring for himself, his eyes some say were doused in flames red as the desert sand it self. Ganondorf was intent in finding this object, even at the cost of his own life. Not much is known about Ganondorf's past though it was documented that he was a member of the dark wizard tribe from the desert plains. It is also noted that he was well gifted in both the sword and alchemy. There were many throughout the history that had mastery in either using the sword or alchemy but very rarely both. His name within the desert kingdom became known as the king of thieves. It was said that in the ruins to the far east of Hyrule there laid a forest untouched or unseen since the creation of the earth. The forest in this part of Hyrule was unlike any forest in any of the other kingdoms. Because the leaves of the trees in this forest were made of a golden light, it is said that the gods that left the Triforce created this wondrous forest. And a towering shrine to house this artefact of power shielded it from the outside world. It is inconceivable that Ganondorf would find such a place. 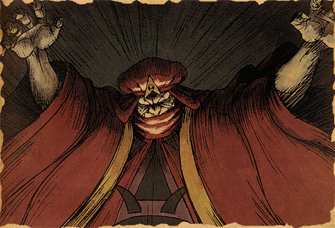 Though the last documentation of Ganondorf's appearance was in the east. Did Ganondorf find this mythical forest? From reading the ancient Hylian scrolls, his lust for greater power had no end. 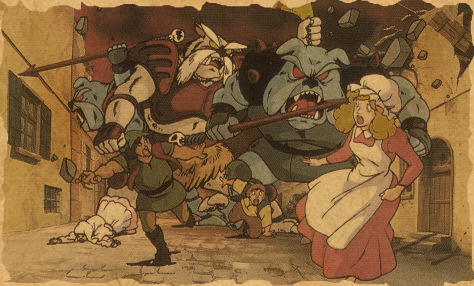 That was the last time any documentation had been recorded of Ganondorf's whereabouts. 1000 years later the mountains in the northwest began to slowly grow in a dark vale. The green forest at the foot of the mountain began to loose it's bright green colour, eventually the colour turned to a dull greyish green. And mist formed around it, and soon it became known as the Dark Forest. And none dared enter it. Local villages where raided, torn and burnt down, a force like no other had appeared. Some documented that a tower that reached the skies was built at the summit of this mountain. The mountain it self had become known as Death Mountain. On the day that war was waged many great knights of the king in the Hyrule capital were killed. In a desperate attempt to save the kingdom from this force. The king ordered the greatest magicians and sages throughout the Hyrule kingdom. To create a weapon, to repel this force that beckoned the destruction of Hyrule. As each side waged countless attacks against each other. The weapon the king ordered to be made was finally finished, and was presented to the king at Hyrule castle. The weapon was a single blade, a sword crafted from the purest and strongest metals in the Hyrule kingdom. It was forged in the amber's of a great volcano in the far east of Hyrule. It was said to the king that only one of pure heart can wield this master of blade's. The king had no choice but to lay this blade to rest, as no knight in the kingdom could wield it. Time had grown too short and with no restitution on the war being resolved. The king in a final attempt created a small group consisting of his greatest knights, wizards and sages. Led by himself he decided to face this faceless creature at Death Mountain. 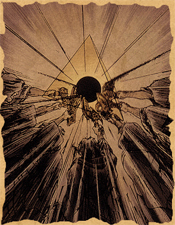 The king and his small group managed to slip past there defences unnoticed, they eventually reached Death Mountain summit and entered the faceless leaders tower, that reached into the skies. They fought there way into the inner chambers of the tower on the highest level. And a man stood tall shrouded in the shadows Presented himself. Ganondorf is my name, and I do not know how you have reach this tower but you all shall finish here. He held up a golden triangle, the artefact of power. And with a loud shout cast the words "Sentence doom those that intrude to death". Though before he could cast it the king threw is blade into Ganondorf's chest piercing his heart. Though it was thought to be all over Ganondorf started to laugh. "You cannot win like this fool�s, I have no heart in this form, ha-ha! I will outlast the Gods themselves!" the blade began to crack and fall apart. The only remaining option left to the king was too order the wizard's and sages to cast a seal to the realm of the timeless void. The blade that had impaled Ganondorf brought them enough time to complete the seal. Not known to them and still clutched within Ganondorf's hands. The artefact of power was still held. As the seal closed up the wizards and sages did not know if that was the legendary mythical Triforce told in the old hylian scriptures. And if it was would this seal hold such a man?. The blood of wars was over, the king headed back to the Hyrule capital and the army in the west was dismembered and destroyed. Hyrule rejoiced at the victory in their hands. Many centuries has passed since then the western lands of Hyrule have gone into a dark slumber. The Hyrule kingdom has healed its wounds since the blood of wars. Though only of recent decree has a wizard from an unknown kingdom emerged some 50 years ago. This was when at the time the land of Hyrule was torn and ravaged by plagues, drought, famine and unknown fires appeared. And for no known reason the crops would not grow, food and clean water was in short supply. It had gotten so bad that many villages and towns had to move location; one of the villages that was recorded was the Kasuto village in the west. They had to relocate to a more central location. As this misfortune continued, a man, a wizard by the name of Agahnim appeared. For the king of Hyrule sent out a plea for help across the lands to every kingdom. As at the time there was no known cures for these disasters that had been occurring. A wizard presented himself at the castle in the Hyrule capital. "My name is Agahnim" He says to the king and I will save your lands from these ill tidings. And just as the wizard said, Agahnim cleansed and restored the Hyrule kingdom back from these terrible misfortunes. As a reward the king made the wizard the royal adviser, 2nd in authority only to the king himself. It appeared Hyrule was once again saved and resting in peace.